Architecture / Media / News Bites / News Would the Sears Tower have survived 9/11? Possibly. Or the Sears Tower might have collapsed faster and more catastrophically than the World Trade Center towers. "Although WTC 1 and WTC 2 ultimately collapsed, they withstood initial structural damage for 102 and 56 minutes, respectively. Redundant and robust exterior steel frame and hat truss construction provided for load redistribution around areas of impact damage, bridging large, damaged areas. . . . Calculations show that, if not for the damage caused by fire, these structures could have remained globally stable." Corley is senior vice president of the Skokie-based CTL Group of consulting engineers and architects. Drengenberg is a colleague. Corley led the team of engineers that studied 9/11 for the Federal Emergency Management Agency. I asked him if he thought the Sears (now Willis) Tower would have done better. The Sears Tower consists of nine tubes bundled together, only two of them extending to the top of the tower. I've wondered if the tubes that escaped damage would have held up the ones that didn't, keeping the building erect. "There's certainly that possibility," he said. But the variables made the question unanswerable, he went on; and 9/11 itself is a prime example of the difference the variables can make. A Boeing 767-200 jet liner slammed into the north tower midway across the north face, and another 767-200 hit the south face of the south tower at its eastern corner — a "major difference," said Corley. The north tower was struck at 470 mph and the south tower at 590 mph — "momentum goes up with the square of velocity, so that's a huge difference," he said. The north tower stood 102 minutes after it was hit, the south tower 56 minutes. Chris Stefanos, a consulting structural engineer based in Oak Lawn, gave me a more elaborate response. "It's hard to say how the Sears (Willis) Tower wold have performed under a similar attack," he wrote, "because the performance has as much to do with the details as it does the framing system.... While it does seem that the Sears tower would have a lot more redundancy with the 9 bundled tubes, it does still seem conceivable that a well-placed impact in the middle of the portion where there are 5 tubes in a cruciform shape could take out columns and floor framing in parts of all 5 tubes. With the extremely high fire load and long duration of fire, you could imagine the damage spreading to larger areas until enough columns became unbraced to cause a general collapse. "But that spreading of the damage has a lot to do with the details of the connections. At WTC, one of the key features was that the connection of the floor joists to the perimeter frame failed under the continued fire load, then leaving the perimeter frame unbraced. We don't know how the specific details of the Sears Tower would hold up under the extremes of a similar attack, but it does seem that the added redundancy of the multiple tubes would allow significantly more resistance than the WTC Towers." Stefanos was supposing impact above the 66th floor, where the Sears Tower's nine tubes become five. A third engineer I talked with imagined the impact higher yet. Ron Klemencic of Seattle was chairman of the Council on Tall Buildings at the time of 9/11. If the Sears Tower had also been a target that day, he thinks the death toll in Chicago could have been horrendous. "I'm not aware of anyone actually studying this in any detail," Klemencic began, "so anything I say is purely speculation. But there's one important fact that is very telling, and you can draw your own conclusions. The fact is this — the World Trade Center towers were very unique in the sense of having floor slabs that were just shy of one acre per floor. They were 200-some feet [208 feet] on each side. Why that is important is that that width was wider than the wing span of the plane. Look at the photos — you can see the outline of where the plane hit, wing tip to wing lip. Traveling at a very high velocity and running into another object, it can slice through things like butter. "Why this is relevant to the Sears Tower is that the wing span of the planes is wider than the Sears Tower is wide up on the 90th floor. If the wing span was outside the outer columns of the building — now this purely speculation— that wide of a plane hitting the Sears or most any other building would have sliced it in half, and collapse would have been initiated immediately. Right after 911 I made a bunch of presentations about what happened. One of the points I made, and colleagues made, was this — what actually saved a lot of lives in the World Trade Center was the fact they stood there for an hour. Most other buildings wouldn't have fared as well because of the geometry problem." The wingspan of a 767-200 is 156 feet. 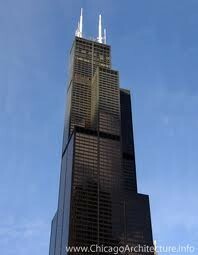 Each of the Sears Tower's nine tubes is 75 feet square, making the building 225 feet square at ground level. But from the 90th floor upward to the 108th floor the tower consists of only two tubes. Up there the building's dimensions are 150 feet by 75 feet. I imagined the severed top of the Sears Tower falling over into the building. Klemencic corrected me. Gravity would probably have kept it upright, he said. As happened at Ground Zero, "some portion of the top would be swallowed by the bottom. How much of the building it took with it on the way down would be a guess. There would be horrendous damage done." The new WTC issue of the CTBUH Journal will not reassure anyone who takes a deep breath before stepping into an express elevator going up. There have been any number of building code changes that make skyscrapers safer at the margins, and that might make escaping another 9/11 a little more likely. But "Evolution of Building Code Requirements in a Post 9/11 World," the article by Corley and Drengenberg, begins bluntly, "It is not practical to design tall buildings to resist terrorist attacks," and nothing in the issue contradicts this. Introducing their subject, the editors report that colleagues "in the tall building world" told them 9/11 did not transform their field. Some believed "tall buildings were actually as safe before 9/11 as they are today, and the relevant suggestion then is that there is actually very little that can be done against flying airplanes into tall buildings." Jan Klerks, editor of the Journal, reminded me that the World Trade Center towers were built to withstand the impact of a Boeing 707. But the 767 is a much bigger plane. And as Corley told me, "What we learned and put in our [FEMA] report was that there are bigger aircraft that could do even more damage to tall buildings. And who knows how much bigger they might be built?" Says the Journal, "Immediately after the terrorist attacks, some people declared the end of the skyscraper. Looking at the hard data since then, it is safe to conclude that this has not been the case. Actually, the past decade has been the most productive 10 years ever when it comes to tall buildings. Of the current list of 100 tallest buildings in the world, half of those buildings have been built in the past ten years."